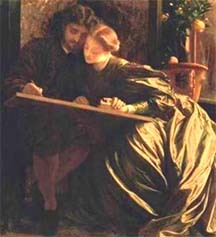 The Painter's Honeymoon" by Fredrick, Lord Leighton above shows the caring and supportive Virgo nature. Virgo steps out in a demure but hypnotique aromatic blend called scented with Lindenblossom, Lime, and a touch of Jasmine. for the fresh, sweet modesty of Virgo. Virgo is a true, patient, and loyal partner, always willing to be supportive and ready to critique the work and efforts of a loved one. You are in quite the traveling mood and for once, you are ready to throw caution to the wind and leave the details undone to experience more of life's mystery and variety. Maybe travelers from far away places are visiting your home. You know the old saying about never turning a stranger from your door because it could be an unrecognized angel. Well this is the time for you to pay heed to that old saw. You got the stuffin's knocked out of you around the election and you are probably still licking your wounds but quiet Virgo soldiers on and keeps a stiff upper lip. The really big silver (or maybe even gold) lining in that cloud is the great fortunes coming to you from a child, or a love interest, or even an independent project or business. Jupiter, Venus, and the moon join together to deliver just what you asked Santa for this Christmas, so keep your attitude positive and keep your eyes open for a Christmas miracle. Financial solutions or an increase in your income may be possible now through art and beauty or a loving relationship. It may also be through a job that allows you to use your intuition or helping ability, especially if you have a helping or nurturing work. A higher spiritual love may be possible with someone who can help you relax and open up to your more sensual self and help you stop worrying so much about being a perfectionist. A hidden matter may block you from participating in a group or family activity. A situation involving an institution may need to be handled diplomatically. Virgo holds the keys to the kingdom this week as all the energy from the planets involved in the eclipse empower you. If you are a typical Virgo, you are being careful with your money and paying attention to details. Saturday's eclipse may be a wild ride, but this time you may be the one to come out on top. Just weather the relationship ups and downs and don't let it get you down. Be secure in the knowledge that you will prevail if you just keep a level head and refuse to get carried away with the considerable craziness. You may even come out on top financially in a way you never imagined. After a particularly difficult two weeks, things are improving. A friendship or love interest is strengthened with the Full Moon in your love and creativity sector. This week spending time with someone in private, perhaps at a resort area or great restaurant may be appealing but you may run into someone you don't expect to see, so discretion is more important than usual. Discreet Virgo decided to bring out the big guns and lay down the law at home. You�ve decided it�s time for remove the obstacles to your efforts to go forward so you�re going to push someone who is dragging their feet. Try to avoid a major confrontation or at least soften it up as much as you can. The recent new Moon in family oriented Cancer means friends around you in the best possible way. Discreet Virgo decided to bring out the big guns and lay down some serious law at home. You�ve decided it�s time for someone to quit blocking your efforts to go forward so you�ve decided to push someone who was dragging their feet. The New Moon in family oriented Cancer means friends around you in the best possible way. Family activities are right where you want to be. A friend or family member who is caring and concerned will help solidify a job or a financial situation. A relationship with someone in the family improves as they show compassion and guide you through a difficult situation. A partner from the past may want to return or renegotiate a relationship, and this person is very usual or highly skilled in technology. Weekly Astrology Blog The weekly planetary influences. After a sketchy patch with you career, goals and plans with family members come together. A major decision comes when work demands clash with family needs. A coworker, sibling, or neighbor may leave the picture after a stressful conversation. Friendships show their loyalty after midweek. Career plans are shifting and you may seriously consider returning to a career direction from the past. New travel and communication possibilities may improve your prospects, even at a current job. Your partner may not approve of the demands made by bosses or the plans for office rearrangements. It�s a good time to enjoy a weekend away with your partner. Your career is changing and bosses may make significant rearrangements. You may reconsider a career direction from the past or the focus of the business may change. Watch out for your reputation, as there may be a miscommunication that affects it. A financial matter may involve an inheritance or settlement. You need to rethink the next phase of your career and decide where you want to go from here. If you want a promotion, it probably won�t come for another three weeks. Someone behind the scenes or an institution is involved in a financial matter that you need to handle. A major career opportunity is unfolding over the next month. A powerful figure is staying behind the scenes but questioning your ability to continue with a friendship. You may find this person difficult, but you may have to do as they ask. Unusual or exotic influences may seem to point to a solid new direction or relationship. This could evaporate before it gets very far, so use caution and see if plans hold up past Monday. A powerful full Moon may bring a friendship or love interest closer. Restrictions and frustrations will continue, although look for finances to strengthen. You may feel like the victim of the fickle finger of fate with problems that you didn't bring on yourself. This is the time to throw out the deadwood in your life and shore up your finances. Cautious Virgo likes to plan for financial security. This is a great opportunity to shore up your future with savings and a safe investment plan. Monetary gains may be made this week, so take this excellent opportunity to get things squared away. A new cycle in family relationships may help you with a financial matter. You may feel out of control financially and someone may come to your aid, which cautious Virgo does not take lightly. If you are careful, you could accomplish something that has been dear to your heart and out of reach for a long time. This week, careful Virgo sees that virtue really is its own reward. Financial opportunities to strengthen your savings and investments are there if you can just loosen up long enough to see the chance when it comes. Someone behind the scenes, possibly a family member, is instrumental. Analytical Virgo might instigate a confrontation before you can stop yourself. Even if you are the moderate person in a discussion, a deeper commitment to a fight will see you ready to take it to the wall. Finances are a red-hot issue now and you will be a formidable opponent. Analytical Virgo may instigate a confrontation before you can stop yourself. Even if you are the moderate person in a discussion, a deeper commitment to a fight will see you ready to take it to the wall. Finances are a red-hot issue now and you will be a formidable opponent. A partnership situation will bring great joy if you can adjust to a feeling of being out of control. A love relationship may be possible with someone who is financially mature and well established. Question for the astrologer: I have remarried after the death of a husband who I loved very much. I am afraid I may have made a big mistake. My 18 year-old son was very close to his father and is having a hard time adjusting to my new partner. I am not sure what to do. The man I married loves me and is good to me, but is much more immature than I thought when we married. I feel deceived. Can you give me any advice? My birthday is April 26, 1962. The astrologer says ... This situation will take a few years to sort out. The marriage may be less stressed from April until December but it will present challenges again after that for the next 7 years. That may just mean that adjusting to the new marriage may put you in a difficult position with your son for years to come. This year is fortunate, especially after mid summer. Your marriage will improve significantly after next January and it looks like you will be able to manage until then. In about three years your relationship with your son may improve and he may adjust to the new stepfather, if you can be patient until then and you appear to have great patience. Virgo goes forward with considerably more authority and gusto than usual. Your motto is always "Don't let them see you sweat," so you appear cool and collected even if you are exploding inside. A financial issue may arise from a romantic gesture where you overspend, or a piece of art or jewelry you decide to buy in the full Moon. Oh, go ahead and enjoy some Irish poetry this St. Paddy's Day. Virgo is cautious even when a partner reads from the love poems of John Keats to coax you into a closer relationship. But you won't tolerate any Irish blarney. More cuddle time is not where you're at right now. You have work to do. A partner may help you through a difficult family battle. A child, love interest or friend may clash with someone you hold dear, and you may have to make a choice. Don't avoid the situation by putting on your rose-colored glasses because when you take them off, the scenario won't be pretty. Your influence is felt this week now that your cautious spending and your excellent health and eating habits bring you excellent results. An unconventional influence might require you to learn new technology or computer skills for your job. An excellent opportunity in work or health is developing. With the most recent eclipse in your sign, Virgo might need to reassess your organization and schedule. Work might bring some changes that will require an open mind. Resist an urge to extend your credit now, or to get upset about family finances. An older family member may visit and they may be fun but there may be unexpected complications. Avoid arguments about the meaning of life or religion, and just enjoy loved ones. A romantic interlude makes you glow. I had a powerful dream and when I woke up, I felt like I talked to someone in my life who died in 1999. She came and told me she missed me and talked to me about the past and I felt that it was a real conversation. Can my star chart tell me anything about the dreams? My birthday is September 24, 1973. Planets can tell an astrologer how psychically sensitive a person is. Dreams are associated with the planet Neptune. You have a very intuitive chart and most likely have often gotten impressions that we usually call intuitive or psychic. Many cultures believe that dreams are only a different side of our conscious reality. Native tribes all over the world believe that dreams are also a reality and that they can gain important insight by discussing their dreams with family members and going back into the dream in a waking state to resolve the issue. Others believe dreams give us a chance to see ahead to the future, and some of the studies on near death experiences have proven that dreams can be prophetic. Given your sensitivity, it is quite likely that you had a meaningful communication from your loved one on the other side. Write down the dream and the feelings you had, and meditate on it. Look at it again in a few weeks, and it may bring a healing experience. Saturn in your sign is improving your finances for the next two and a half years so great progress can be made and you may finally see your prudence and discernment rewarded. The full Moon in friendly Taurus may bring good news from a distance or an opportunity to get more training that will further your career. Love is sound and solid now with someone who understands all the financial bottom lines. The retrograde Mercury in your sector of documents and visitors may mean someone is returning to your neighborhood or office. Venus in your sign works with Mars to solidify financial opportunities and bring stable relationships and partnerships. An unusual partnership strengthens a tie to publishing, greater education or a long distance connection that is valuable. Everything works together to bring discerning Virgo closer to family and a solid financial foundation. Virgo experiences what Hamlet called the "slings and arrows of outrageous fortune" when a surprising blow-out with a friend or lover takes you by surprise. Your solid reputation may bring help from a major player behind the scenes. Gentle Virgo may find life trying as Mercury is in retrograde from June 15- July 9. The details of which you take such excellent care may challenge you as everything seems to be going backwards. Remember the Native American concept of Heyoka, where the world turns backwards so you can see the truth through the illusion. The Solar Eclipse shakes up your partnership and legal sector. Your intuition is unusually strong so have faith in what you feel. Deeply hidden information and intuitive flashes about relationship matters help understand puzzling situations. The Lunar Eclipse in your sign brings finality to a plan that involves work or health. A new financial opportunity may seem risky but you will do best now with new approaches. An unusual partnership may be very fulfilling and help you develop your intuitive side. Love trysts, friendly socializing at a club or creative work are your thing. A new, improved partner may bounce back onto the scene. You may get an offer to do work from the past so if it looks good, take it. Unusual new approaches to relationships or work will be surprisingly successful. Virgo is getting help in business and partnership as the Sun moves into your partnership sign of Pisces. Finances get a boost but don't sign contracts now. Love trysts, friendly socializing at a club or creative work are your thing. A new, improved partner may bounce back onto the scene. Careful Virgo finds others give you the nurturing you crave on this special Valentine's Day. A partner or special friend from the past wants to renegotiate your relationship and finally you feel emotionally safe enough to do it. Friendship or love comes together now. A work matter may make it possible to improve circumstances at home. A powerful boss may be in your corner. Be cautious of anything a coworker says as it could simply be a fantasy and cause a serious rift with someone important. Don't act hastily. Love and friendship with someone who has common sense may be your little secret as this New Moon lights up your sector of lovers and children. A work association or friendship may look better than it is so don't be taken in as it may change suddenly. An expansive and more social outlook at home inspires you to bring more friends in and expand your circle of friends on activities that may involve sports or travel. Social contact may help your income and improve relationships with coworkers. Brilliant ideas may bring opportunities. A friendship with someone becomes more important in your life with the Full Moon in your sector of friendship. A close friend may become a partner and it could become very serious if it's a love interest. Someone changes your life. New Year's may bring a younger friend who sparks up some lightning in your world. Finally, a friend who has common sense about money, something highly prized by careful Virgo. A secret ally with clout may help with an idea that will improve your work. The new moon in your home and family sector brings loved ones closer for the holidays. Big changes are in the works as family members are making changes in their lives. Communications open the door for a better relationship with someone. Home is where your spiritual enlightenment begins during this holiday season. Foreign influences and a sacred feeling all make this holiday season special. Family members are home and there may be good fortune if you don't overdo your credit. Loved ones want to enjoy the holiday glow while you all enjoy each other. Be careful with spending and remember the saying by Mae West, "I can resist anything but temptation." That may be fine ... until you change back into a Virgo after the holidays. A more spiritual and fulfilling period starts at home as you value your family and loved ones more. You may improve the home or create a space to reflect and enjoy your time together. Parties and visitors are planned. A difficult financial matter is tough to resolve. Time reflecting on your relationships with others is well spent. A message or document that was confusing or lost finally gets to you and you will understand a matter that caused explosive feelings. A strong friendship helps you work out disappointment. Someone in the office or neighborhood may bring you a message or a document that brings out strong feelings. A partner wants to come back to you or get back in your good graces. Trips or visitors may change your life so keep your eyes open for good fortune. Change is like pruning the branches on a tree; it stimulates new growth. A break may come with someone, possibly a woman or a sibling, and you may be asked to intervene. Relationships explode with the Full Moon in your sector of foreign matters and values. Siblings bring important new invitations or introductions. Someone in the office or the neighborhood has an interest in you and you might like it. A message or conversation about a relationship or sexual encounter may clear up some confusion. Financial fortune smoothes out a difficult situation in the family. A difficult matter behind the scenes is getting worked out with someone who cares very much for you. A matter that was oppressive is relaxing and a very constructive solution can be worked out. A second chance at a significant love opens up now with tenderness and passion and greater sensitivity than before. This could be new or a renewed spark with a current flame. Romance beckons and you spend generously to make your love happy. A Full Moon in your financial sector brings a change in the way you handle finances. The change actually began last March and the best approach is becoming clear. A message from a partner who wants to return may surprise you. Patience with those you love brings good will. An obstacle at home is soothed as you get a chance to discuss a financial and relationship matter with a love interest or friend. Siblings are helpful and great fun. Coworkers and neighbors get you out and insist that you party. An eccentric partner wants to renegotiate the relationship. The solar eclipse may upset your financial equilibrium, but if you think back to Sept. 9 to 13, a new plan may have started that will become more lucrative. If you can recall any opportunities at that time, they should bear more fruit than you thought. Virgo's usual love of work gives way to a need for romantic abandon and passion. Or at least good friendship. An impulse to spend on objects of beauty or love may be impossible to resist. A powerful family member confronts you over a hidden matter. Tuesday love is back on track. Time alone rebalances you. A relationship with someone is reconsidered in the rays of the lunar eclipse. A significant shift comes suddenly as you decide its time to get down to business and handle details. Saturday a volcanic argument at home becomes more serious than expected. Work, which has been a haven for you, becomes unpredictable. A secret ally is powerless to help now and you may decide the workplace structure is falling apart. Take extra care with your health and eat well. Finances appear to improve but keep an eagle eye on them. When Virgo talks, people listen. The New Moon brings the order and attention to details that you like as others finally begin to settle down after the carefree summer. Your heart has a secret hope for love, but your love interest will commit and then disappoint you. Virgo strength is quiet and firm. A powerful figure is in the background helping you, but difficult circumstances involving the family could materialize. You may make job changes as something or someone is not what it is appears to be, and the force is definitely with you. We are not a measure of our work alone. The Full Moon brings strange circumstances at work, but you have the support of authority figures behind the scenes to help sort the confusion. Someone wants to return to your life but you cut ties as their eccentricities are too much. Virgo is so discreet and modest that no one would guess at the powerful happenings behind the scenes. An authority figure may help you establish yourself, but you're nervous about incurring obligations. At the end of the week, things turn your way when you put your foot down. Forgive the transgressions of the past. Someone wants to reunite or renegotiate a partnership from the past. It will bring joy and healing if you can overcome previous feelings of betrayal. This is a unique opportunity to go forward into a better place of love or friendship with this partner. Remember, trouble helps us grow. Details and actions may meet with constant blocks and setbacks so concentrate on fun and friendships. The New Moon in your house of secrets brings resolve to go after what you want in life. A partnership is unpredictable until late September. You discreetly allow a friend, possibly a major player from your past, to steal the limelight. You do occasionally enjoy secrets and this one will bring you a great deal so all your discretion will return as good fortune. Inner strength is the greatest strength of all. The Full Moon in your sector of lovers may bring a shift in a friendship that you thought was draining your finances. Virgo likes to roll up the sleeves and work, but it's time to let others (Geminis) teach you how to dream and play. Inner strength conquers difficulty. A person of authority or a special boss may help you navigate rough waters with a difficult enemy or a reservoir of anger within yourself that erupts like Mt. Versifies. It may force you to advance in life and replace frustration with determination. Friends provide emotional support. Friends help you cope with a very difficult situation that may involve an authority figure or agency, like a bank or hospital. Responsibilities loom up like a dark cloud but the ray of light shines when friends come forward to help. After you've done all you can trust the universe. A sensitive work situation may demand a decision and you may make an office rearrangement. A difficult situation behind the scenes needs to be diffused so use your best judgment and listening skills. The full moon in your home sector means "Just say, no" when the boss asks you to work overtime. Workaholic Virgo will surprise everyone and run off instead to do things with loved ones. Spend time at the gym and enjoy your summer. Let others handle details themselves. A major blowup rises as it becomes clearer that you aren't getting the cooperation you need from someone. An incompatible situation between work and family is peaking. A showdown builds as the immovable object meets the irresistible force. Try not to feed the fire by arguing. A powerful but hidden ally helps you secure a job coup and impress a boss with your wit and original ideas. Steady Virgo is known for quietly working behind the scenes to make things run smoothly. Be patient with rough spots but don't be seduced by a fantasy someone throws out. A great career coup comes from a boss who may be younger (or just seems younger) and full of vigorous new ideas. This really will work out, so if asked to sign on the dotted line, get your pen out and go. Someone behind the scenes really delivers for you. At last, a Full Moon that delivers the goodies to Virgo while others run for cover. While emotional explosions hang around siblings and neighbors, you remain cool headed and discreet. If you play your cards right, you'll get the commitments that will deliver your heart's desire. A great new opportunity comes through more education or travel, or both. Someone with a foreign connection may open major doors for you. New ideas you have are inspired now and may be the best you've had in years. Avoid arguments about home improvements. Financial dealings behind the scenes are exciting as you move into the fast lane. Work may be part of the new scene. A financial partner spends money so fast it makes Mario Amoretti's Indy 500 races look pedestrian. A friend who is observant gives you the inside skinny on gossip. Virgo is at odds with itself, with friends and family feeling they don't recognize you. You may be less analytical and more touchy-feely. It's a phase that will pass as it's unlike you to be this emotionally vulnerable. But it's a nice change so just let yourself act like a Pisces. The Solar Eclipse in your inheritance and financial partnerships sector may bring an unexpected windfall of money or a settlement in your favor. Work and career may bring a special relationship with someone, possibly romantic, or just one that improves your life. A partnership may bring a surprise as someone needs more freedom, or a job could finally come together now. Your intuition is especially deep and accurate, so listen to it. Someone from the past may want to reconcile. A secret revealed is very significant. Expect confrontations this week but try not to blow the lid off by making a critical remark or pointing out someone else's shortcomings or mistakes. Communication will get better on Sunday when you get good news and cooperation. Virgo is at odds with work responsibilities, which calls for unusual approaches that probably aren't working yet. In your personal life, you have a new attitude and some new playmates, maybe coworkers, which breathe fresh air into your moods and outlook. A new wrinkle in your job comes when a co-worker or neighbor realizes someone is not what they appear and decides to do something about it. This may lead to new opportunities to improve the workplace with innovative approaches. Love is great now. Love and ideas for a new business approach ring in the New Year. A conversation with a love interest, who could be a long term partner, makes your head buzz with New Year's resolutions, one of which is to be closer. Enjoy the holiday celebration. You finally have a powerful ally close by or in the office. You like to keep your passionate side a secret but now it will be a secret you share with someone who also has powerful passions. Someone may initiate a final financial break with you and it may involve a sibling. The Lunar Eclipse brings an unusual goodie basket of new income potential, which would be fine except for the roller coaster ride coming with it. Great patience will help you sort out this Chinese puzzle. Keep your eyes and ears open for partnership issues. Finances may improve due to a partnership or love interest with Jupiter and Mercury in your house of love and independent work. This may lead to a better living situation with more fun and enjoyment of loved ones. Someone in the office or neighborhood may share a secret. Financial improvements come from love and beauty; maybe yours or maybe as a business. You may need to reconsider a business matter after Oct. 1 but it will not become clear until after Dec. 10. Someone important helps finances behind the scenes. A relationship reaches a turning point with the Full Moon on the 17th. This may bring a financial improvement but with a power struggle that may go from a hiccup to an explosion. This is a force too powerful to take on � even for you � so caution is advised. A major discussion with a partner may bring some surprises and freedom may be at the core of the issue. A surprising break may free you to move forward in your life so recognize that this may be necessary and for your own good. Finances gain from an inspired and imaginative new direction that brings greater fulfillment. A legal matter may also be settled in your favor. Greater stability comes through a family member or an old and established friend. A difficult power struggle is distressing with family or with co-workers. Just ignore anyone looking for a fight, as you know you will clean their clock anyway because your grasp of most situations is more precise than most. Someone helps with a financial partnership. A lot goes on behind the scenes with love, friends, family and a lot of good gossip. A close friend will give you the lowdown on some office intrigue. Private time with friends is great fun. Splurge on something you have wanted. Big shifts behind the scenes may mean a major shake up at work. It could be due to information you share with someone. You may have had it with some of the shenanigans and be ready to wash your hands of office matters. A yoga class will rejuvenate you. Love and money dovetail into romantic, relaxing summer breezes. Read a luscious summer novel and watch some great outdoor plays. This is the reward for being so vigilant with details at work, although Virgo does love work. Friends may need financial help, but that or a social event may cost more than you bargained for. A partnership will benefit, so just go along with the plans. Decide ahead whether you want to lend a friend money, as it may be a subject that comes up. Close friends and family groups want you to spend time with them. You are able to take a good look at what you have accomplished and feel the sense of achievement. Behind-the-scenes scenarios bring excitement into your life with financial news. After a brief confrontation, friends and loved ones are nurturing. Modest Virgo feels the glow of family love and support. An opportunity for more freedom at work is due to a suggestion of a partner. Start a project with the attention to detail you love. Career matters improve with documents or communication but you cast a doubtful eye on the reliability of coworkers. A conversation with a partner may become an altercation but Saturday both of you put it in perspective. Family demands more of your time. Important career developments roll in with the tides of the new moon Monday. Tie up loose ends this week. Conversations bear the fruit of new ideas so stay open to suggestions. Someone talks money but don't put your cards on the table. A partnership communication brings resolution and you feel at peace. An unreliable rascal at work may be up to his or her old tricks. Relationships are like the weather this week, everyone talks about them but no one wants to do anything about them, so be patient. Someone may deliver a career plum, possibly at a distance. Don't let the sound of gold hitting the table distract you from making plans to get more training. A partnership may present a serious dilemma so if you need to move on, as the Nike saying goes, "just do it." Finances are challenged by someone using bold and colorful language. Keep your usual Virgo cool and give them a disdainful look and it will intimidate to some degree. A friend's wisdom is a great source of comfort. Work is like a giant Chinese puzzle. The financial picture looks so good that modest Virgo may buy some new threads. Someone passionate pulses back into your life on the beams of the lunar eclipse, but careful - remember the past; "Like a demon you possessed me, you obsessed me constantly." Something at work is shady and coworkers are creating a smoke screen. As the song "9 to 5" goes, "It's enough to drive you crazy if you let it." Hard working Virgo is also discerning so you probably avoid office politics by working out at the gym instead. A woman opens doors for education or travel. The solar eclipse shifts your life as fast as Mario Andretti racing the Indy 500. Someone exciting and bold leaves you breathless but expect trouble when this clashes with family responsibilities. Finances are vulnerable so you resolve to become more financially independent. A serious talk with someone who fuels your hidden passions opens the way for another try, although you have serious doubts about the financial viability of the situation. You may try this one again but don't overestimate the potential. Finances may hit a legal snag. A financial opportunity or settlement from the past reappears but give it a lot of thought, as it is more risky than your usual financial undertakings. A difficult matter with someone close by finally heals. Work is more fun as coworkers are more lighthearted and energetic. A partner or friendship comes up for review and you are ready to make a decision after a lot of fun and warm fuzzy feelings. You are ready to get back down to business. A loved one wants to make you happy and plan more time spent together doing things you enjoy. Let them pamper you. A partner is dreamy and seductive but be careful of the hidden aspect of this relationship. Much here is not clear but some surprising communications could reveal hidden thoughts and feelings. Work improves finances with an opportunity. A love interest could investigate a business partnership. Work and coworkers may shift as technology is introduced. If your boss looks better, it may just be that ultimate Virgo dream of falling in love with the boss so proceed with caution but it may be hard to resist the sparkle dust Neptune is throwing into your eyes. A partnership requires caution. A boss has unconventional approaches to work. They involve a lot of new ideas and perhaps introducing new technology that takes a bit of learning. Sunday a business savvy love interest may come in your direction. A new business opportunity appears for you but it will take a lot of work. A love interest returns from the past and a romance is discussed. Money is part of the issue, which may lead to a confrontation. A powerful conflict with a boss may stem from a feeling that you are being discredited or that someone is claiming credit for work you have done. Negotiate this carefully. Amid all the progressive new ideas flying around you from a powerful boss at work, you are not seduced into a false sense of security. While others fiddle while Rome burns, you stick to your responsibilities and a love interest with a lot of financial common sense is a welcome relief.